Step 1: If you hold a US passport, be sure to have pristine US dollars of $135 or more (in case they reject any). Between Annie and I we had two $20s and one $5 rejected. Two stops on the Peru side, walk across, then one stop on the Bolivia site. Step 2: Book a bus to Copacabana or La Paz. We booked with the company Tur Peru to La Paz which will take to you to the border of Peru, where there will be plenty of money exchange counters, then wait for you on the other side next to the Bolivian immigration office. You have to walk across the border on foot. Once in Bolivia, the bus stopped at Copacabana for an hour to change bus. Also, they don’t tell you this, but the bus will then need to cross a river where you’ll need to get out, buy a separate ferry ticket, cross the river, wait for the bus to cross the river, then hop back on. 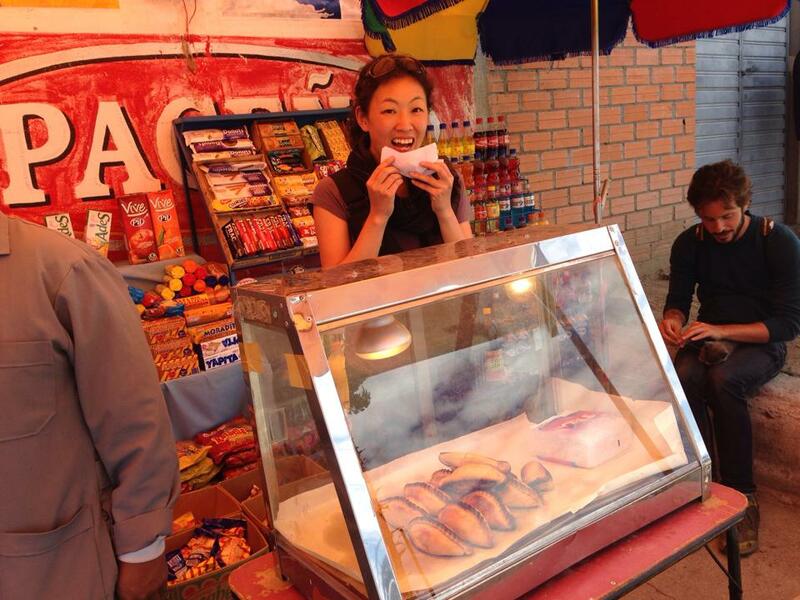 First of many delicious salteñas in Bolivia. Photo courtesy of Annie. Get a salteña at the border of Bolivia. It’s freaking delicious! Next story Pampas, Rurrenabaque – Amazon Round 2!